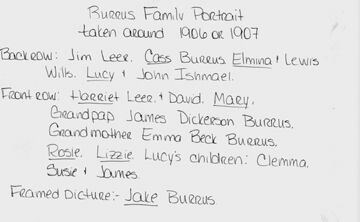 Jake E. Burrus was from Shelby County Illinois. He was killed in a hunting accident shortly after the Burrus family moved to the Bixby area, around 1900. John Ishmael, also from Shelby County Illinois, died in 1910 from a long illness. Following John’s death the Burrus/Leer/Wills/Ishmael/ group moved westward into Creek County, near Bristow and Drumright. 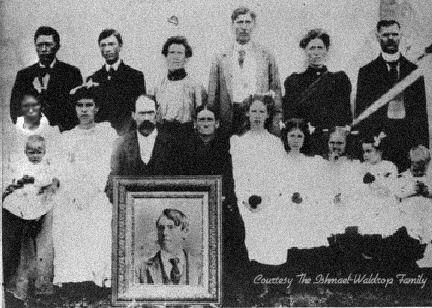 The photograph, below, was taken after the family moved to Oklahoma and Jacob Burrus was killed. However, it was before 1910 when John Ishmael died. The bottom image shows names written on back of the photograph. 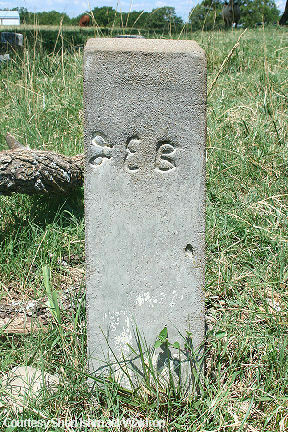 Graves of John Ishmael and Jake E. Burrus, Sanger Cemetery, Southeast of Bixby. Photos courtesy Sheri Ishmael-Waldrop.